Recently we were on the hunt for business computers for a family member’s new office. Being a computer geek who has built my current PC from parts all sourced on sale during one Black Friday, I was tasked with finding something affordable yet still speedy enough for a business on a budget. 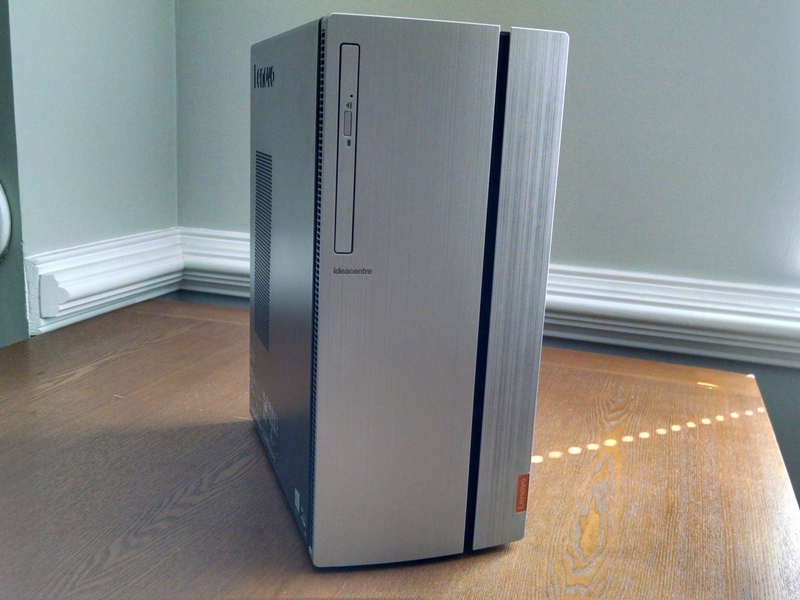 In the end, we settled on three Lenovo Ideacentre 720 computers from Costco. Here are my thoughts on everything about this PC – the good, the bad, and the ugly, and why a self-proclaimed computer geek would buy a pre-built computer from a manufacturer. We purchased this computer from Costco online for $399 plus $15 shipping. This is a great price for this computer. Best Buy is currently selling this exact computer on their site for $569 on clearance. At the $399 price, we would have to settle for a computer with an Intel i3 processor if I had went to the local Microcenter. Quotes from a group purchasing organization were in the $600 range for something similar. I estimated I would have had to pay around that price if I decided to build my own with the individual parts along with a copy of Windows 10. Lenovo offers a one-year warranty. Costco doubles the manufacturer’s warranty to 2 years. We also paid for it with the Costco Anywhere Card, which added two more years for four years total. While not as good as next day parts replacement with a business warranty plan from the group purchasing organization, not having to worry about problems for four years is nice. Not bad for $399. Looks-wise, the Ideacentre 720 is a good-looking computer that would look great anywhere, whether at home or at the office. 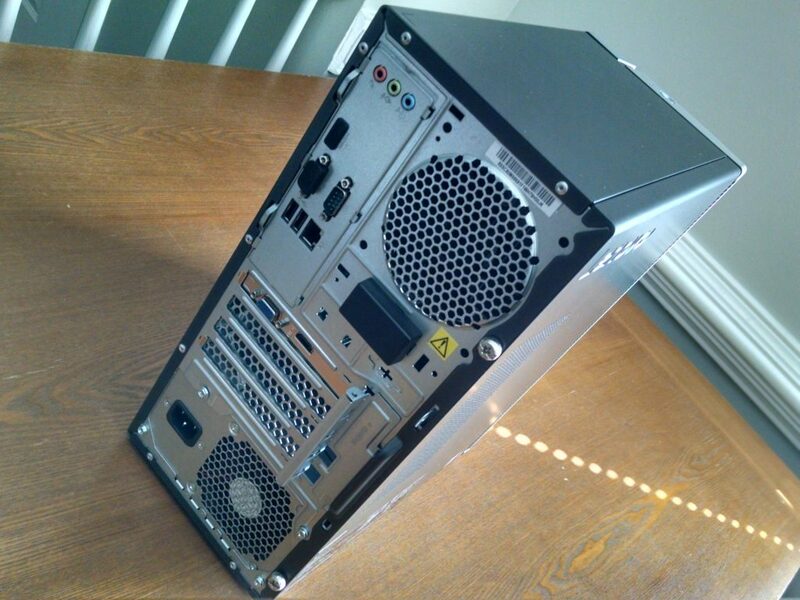 From online, it appears that the front of the case could be brushed aluminum but it is actually made of plastic. 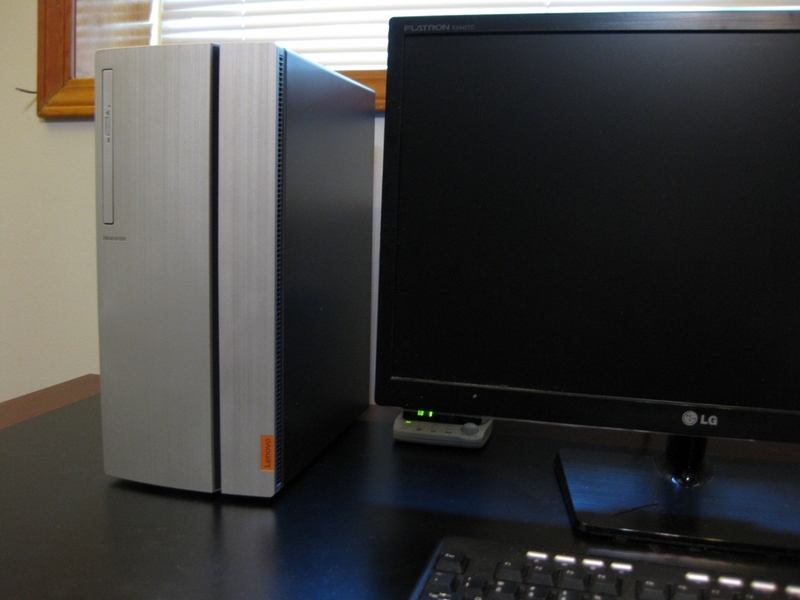 The computer has a sleek appearance with a panel on the right side of the case that slides over to reveal four USB ports, line-out and mic connectors, and the media card reader hidden behind it. The specifications say there is a 5.25 inch external bay, but don’t expect to be able to use that to install anything that needs to be accessed from the front of the case because there are no other openings other than the one for the vertically mounted slim DVD/CD drive that is like those used in a laptop. 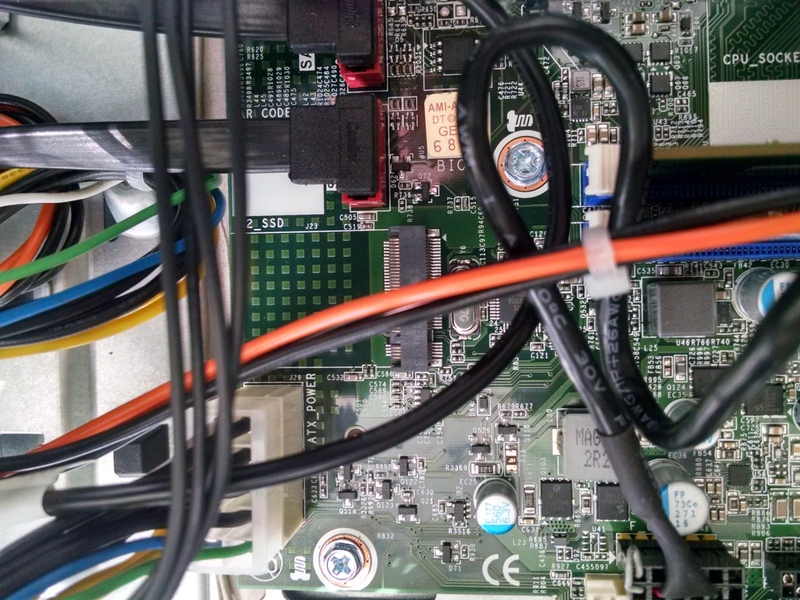 The back of the computer has the line-in, line-out, and microphone ports; two more USB ports; a serial port; and the Ethernet port on the motherboard’s faceplate. There is also a HDMI and VGA port, but they are covered up with rubber covers because they aren’t active due to the PC not having integrated graphics. 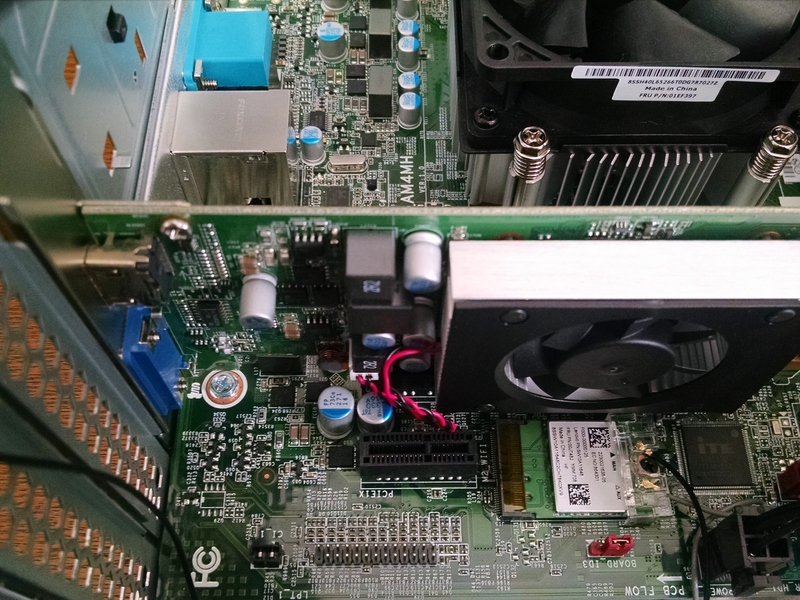 There is a HDMI and VGA port on the AMD Radeon video card in the x16 PCI-E slot. It’s a good thing that the two USB ports in the back are the slower 2.0 variety since we really don’t need much speed for connecting a mouse and keyboard. The two high-speed 3.0 USB ports are at the front of the case, easily accessible to plug in USB flash drives, digital cameras, or hard drives. Getting inside the case is a cinch with two thumbscrews to remove, no other tools required. Although you might need a screwdriver for the first time since they did crank those thumbscrews down pretty tight from the factory. Everything else inside that’s replaceable, the graphics card and drives, are also tool-less. 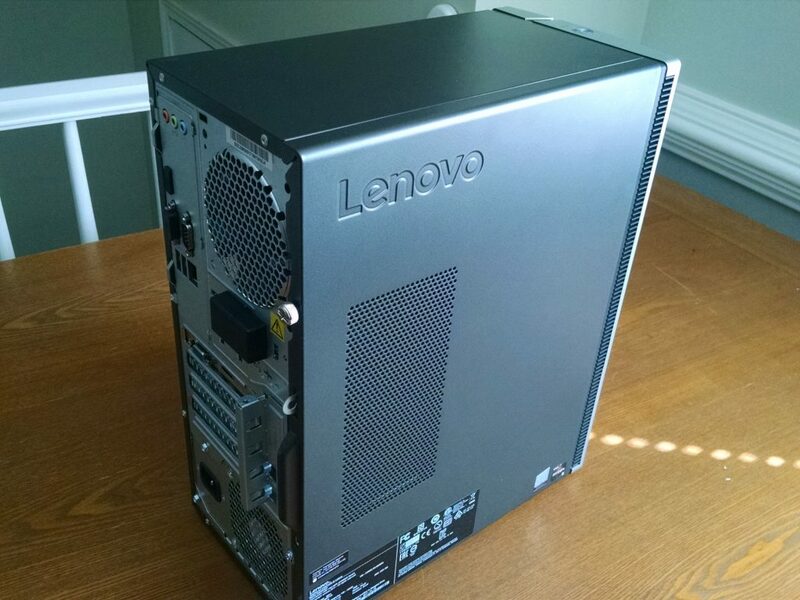 A friend says that the computer looked big from the online images, but it’s actually a compact and light computer. The case measures 14.8” high by 6.5” wide and 12.8 inches deep. The shipping weight was 21 lbs, which included the mouse and keyboard. With the Ryzen processors, AMD finally has a competitive CPU again to compete with Intel’s offering. The Ryzen 5 1400 CPU benchmark results show that it is equivalent to an Intel Core i5-7500. Most reviews say that for gaming, the Intel i5 does better because it has better single threaded performance. For a multitasking environment such as in an office setting where multiple programs such as a web browser with many tabs opened, spreadsheets, and word documents are all running at the same time, the AMD CPU should be a better performer due to it having 4 cores and 8 threads versus Intel’s 4 cores and 4 threads. At the present, 8 gigabytes of memory should be the minimum amount installed in a PC. With all the sites these days that are embedding autoplay video content, I’ve observed regular slowness on my laptop with 4 GB of ram when the web browser with a dozen tabs open chews through all the available memory. Naturally, the first thing I did upon getting the Ideacentre was to open it up to look inside. If you are looking for a laptop replacement and you do not plan to do much upgrading of the components, the Lenovo Ideacentre 720 would be acceptable. However, if you are a PC enthusiast, stay away. I give the upgradeability of the AMD-based Ideacentre 720 a F.
The major drawback of the Ideacentre design is a proprietary power supply and motherboard. The Ideacentre comes with a 250W power supply that has the bare minimum of connectors. 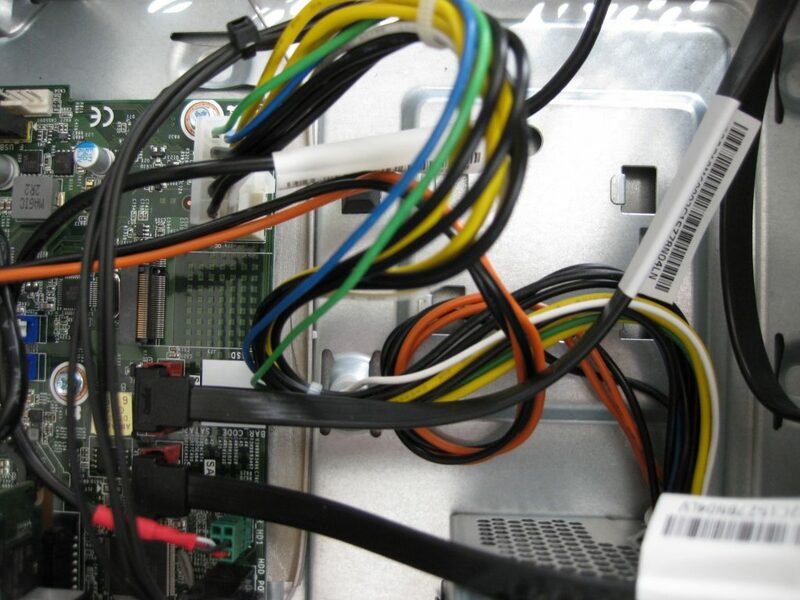 There are no 4-pin molex connectors or SATA power connectors to add additional drives. In fact, there are no molex or SATA connectors at all if you were thinking of using a Y splitter. 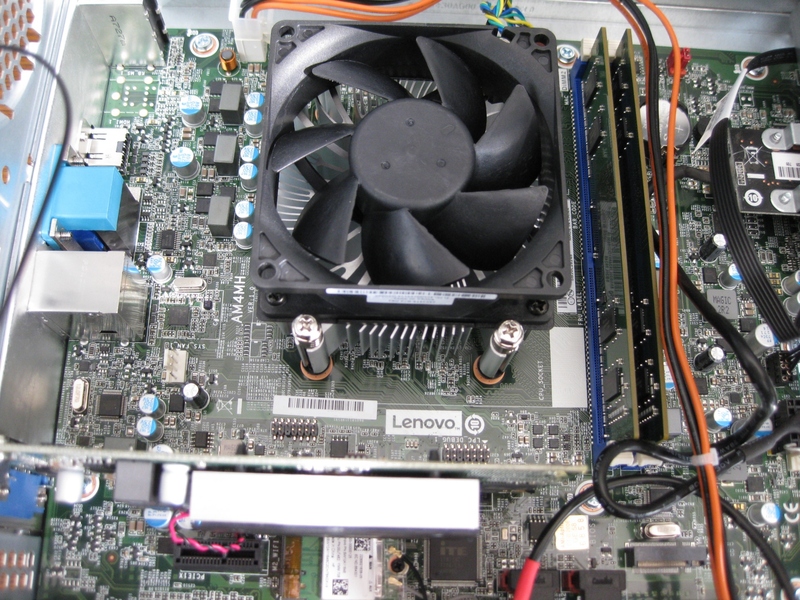 The power supply connects to the motherboard with a Lenovo-specific 10-pin connector instead of a standard 24-pin ATX. Usually the two components that are most likely to go bad in a computer are either the power supply or the hard drive. 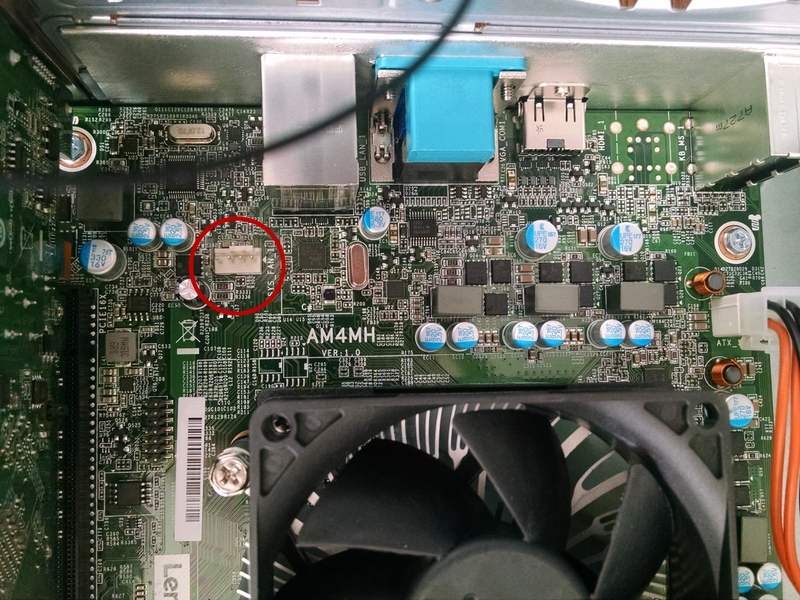 If the power supply dies, you will need to wait for a replacement from Lenovo or buy a 24-pin to 10-pin adapter for the Lenovo Ideacentre if you want to use it with an ATX power supply. If you are a gamer and think you might want to upgrade the video card in the future for higher frame rates in your gaming, the Lenovo power supply will also limit your choices because there isn’t an available 6 pin or 8 pin power connector for the more power-hungry graphics cards. 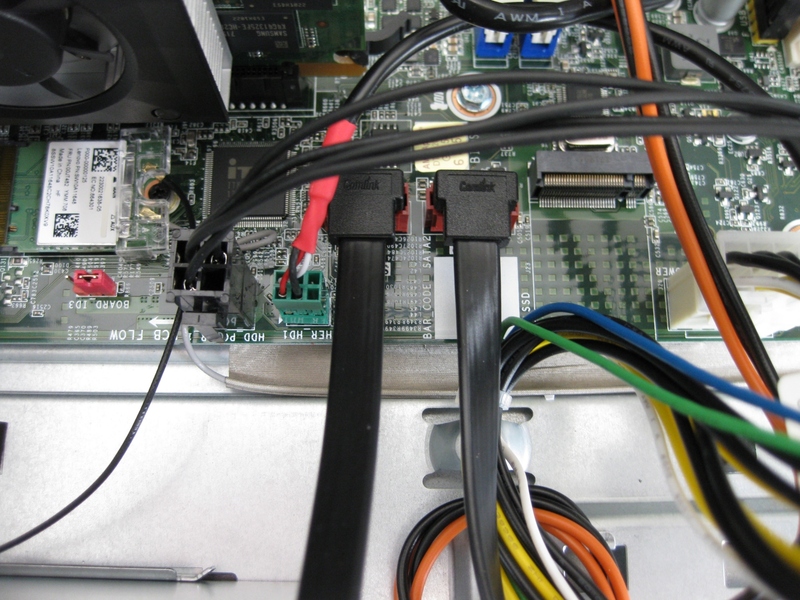 The motherboard has a connector coming from it that supplies the power to the DVD and hard drive. This is the black connector to the left in the above photo. This means that if you want to add a SATA SSD or another hard drive, you will be unable to unless you decide to give up the existing hard drive or go without the DVD drive. But adding drives probably won’t be possible either because the motherboard only has two SATA ports, which are red in color. Both are currently used by the Seagate hard drive and the DVD drive. You do have the option to add a SSD with the open M.2 slot located at the bottom right of the motherboard. But you will need to buy the bracket (part number 01EF905 – M.2 SSD Brkt Assy 213mm MB) that secures it to the case because Lenovo cheaped out on a $10 part and didn’t include that either. I’ve seen people screw in a piece of plastic with a sheetmetal screw to the case and secure their NVMe SSD to that. The motherboard supports 32 gigabytes of ram, however there are only two memory slots, both of which are filled with 4 GB modules. I would have preferred more slots or if Lenovo used a single 8 GB DIMM, leaving a slot free for the future. Since both memory slots are occupied, if you want to upgrade the memory, you will have to replace the current modules. If you’ve looked at ram prices lately, they aren’t exactly cheap. The specs for the AMD version of the Ideacentre 720 shows that it has one full-length PCI-E x16 and one half-length PCI-E x1. The Radeon R5 340 occupies the x16 slot and the x1 slot is available. Luckily the Radeon card doesn’t take up two expansion slots of space like I’ve seen in another Ideacentre so you’ll be able to use the x1 slot to add an expansion card. Maybe a PCI-E SATA card for additional drives if you solve the power supply connector issue. There are also two M.2 slots, one of which is used for the wifi card as seen in the above picture below the fan for the Radeon graphics card. For cooling, there is a fan on the CPU’s heatsink and on the AMD Radeon R5 340 graphics card. Having only two fans helps with keeping the noise to a minimum. During normal use, the computer was nearly silent with the hard drive making more noise than the fans themselves. If you find your Ideacentre 720 is running too warm for your liking, the motherboard does have two 4-pin headers for you to add additional case fans. Another reviewer said that he was able to add a 92mm rear fan and a 80mm intake fan to their Ideacentre. The Lenovo Ideacentre 720 may not be easily upgradeable, but it could still make a good choice for your computing needs depending on what you are using it for. For what we paid for it, the four year warranty, and where the computers will be used, it made good financial sense. In four years when the AMD Ryzen 5 CPU starts to run the newer programs slower, we can still upgrade the CPU to a Ryzen 7 1700 or faster for a fraction of today’s prices not to mention boosting the memory up to 32 gigabytes. I generally prefer desktops for home or office use over laptops due to easier servicing and better cooling. I’ve had to take apart several family members’ laptops after a few years to blow out the dust that was clogging the exhaust fan and causing overheating. Do you prefer laptops or desktops? Do you build your own computers or buy from a major manufacturer? You didn’t mention which credit card you used to purchase the computer, but I’m assuming it was a Citi Card since you mentioned Citibank. Citi Cards offers a separate extended warranty that will extend the manufacturer’s warranty for additional 2 years as seen in the benefit guide below. The “business warranty plan” was something that was offered by the Group Purchasing Organization. I’ve clarified that in the post. Excellent Review very helpful! I’ve had 3 WD MyCloud NAS devices over a 4 year period and they all burn out. Yes, they are covered by warranty but since I have 4 computers that backup to the NAS, I’m not about to send my old burned out drives back to WD for them to recycle with my files on them, encrypted or not. I’m seriously considering using this Lenevo as a NAS device … swap out existing HDD drive and DVD and replace with 2 Seagate NAS Drives and download NAS software. Based on your review I believe I can use the SATA and Power connector that are used for the DVD Drive for the additional Redundant Drive that I want to install in its place in an open bay. Based on your examination of the this machine, do you see any problems with this? I could use an old computer and do the same thing but for $399 it is worth the money to start with new parts.